Ben’s Wine & Tapas is Open! BEN’S WINE & TAPAS opened on 9th February. 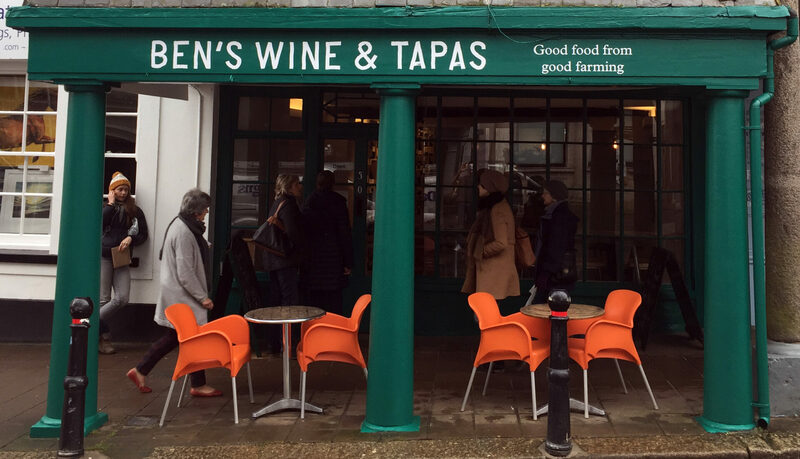 If this is news to you, we’ve taken over what was the Tangerine Tree Cafe at 50 High Street, Totnes and turned it into a wine shop / bar / small plates eatery. Something between a Spanish Tapas bar and a Venetian Bacari (we’re keeping our options open). Here’s a précis of what we said to the local rag; ‘We’ve always taken our wine seriously but being a farm shop, steeped in all things local, it’s hard to show off our full credentials. 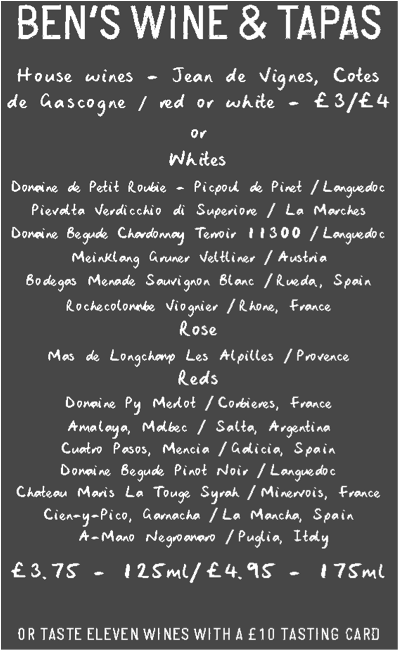 We want to introduce you to new and exciting wines from around the world at fair prices that represent their real value. The quality of what you get in your bottle makes exponential leaps from supermarket entry-level prices but once you get to a certain point it seems as though you’re paying extra for a name and not much else. So we’ll be concentrating on mid-range, £8-£15 wines because that’s where the value is. They’ll be for sale to take-away or, with a £6 corkage charge, to drink in. That way you can enjoy a fantastic bottle of wine for the price of a few pints in the pub. We’d also like to tell you about the wine. Most of it will be from grower/winemakers so it’s a true farm product. As much as possible, we buy straight from the producer so although not local in geographic terms, in spirit and ethos it certainly is. 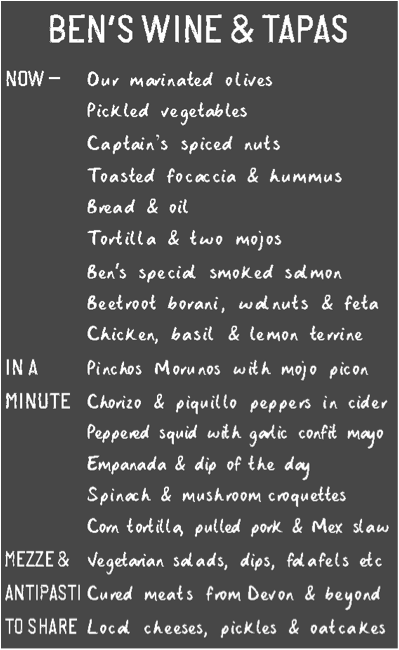 When we say tapas, I admit we’re generalising. What we mean are small plates of tasty but simple food served quickly, with, or just after you get your drink – as in a traditional tapas bar that doesn’t have pretensions to be a restaurant. Much will be Spanish themed, with a bit of North African, Mexican and Middle Eastern. There will even be a bit of the best of British – one of our bangers with a dollop of Tracklements mustard takes a lot of beating. There’ll be local, seasonal and dietary variations and with organics, the sourcing will be the same as the rest of the business – i.e. the vast majority will be organic but most of the recipes won’t be certified. Last year, at our kitchen on the farm, 98% of the ingredients we bought were organic but only 65% of what we produced was certified as such. Yes, I know – we’re mad. 98% in – 65% out wouldn’t normally be a formula for success. Son Harry, who I hope will be a familiar face to many of you (he’s worked in all three shops, on and off, for ten years plus) is in charge. It probably should be called Harry’s Bar but, given that reason for the name change is to eliminate confusion, we thought we’d go with Ben’s for the time being.